Our mission at American Airgunner is to promote non-powder guns (airguns) as safe, recreational, hunting, and sport shooting products while informing and educating viewers about the safe uses of airguns and related products. American Airgunner first aired in 2008 on Sportsman Channel. At the beginning of 2012, production was assumed by Umarex USA, Inc., under the direction of Fort Smith based 5 Star Productions, LLC.. The 2013 season was hosted by Rossi Morreale with Steve Criner covering airgun hunts and featured airgun experts such as Tom Gaylord, Jim Chapman, and Rick Eutsler. American Airgunner is now on a production journey that includes airgun hunting featuring the American Airgun Hunter and the Dog Soldier, technical segments and challenges in which shooters use both skill and strategy to knock down and explode various reactive targets with a multitude of airguns. You can follow American Airgunner by watching the show on the Pursuit Channel, visiting AmericanAirgunner.com, liking the Facebook page, following our Twitter account, checking out our images on Instagram, or subscribing to us on YouTube. The Pursuit Channel is available in 38 million+ households in various cable systems across the nation and as part of the basic subscription service on both DIRECTV and Dish Network. Pursuit Channel can be seen on channel 604 (PRST) on DIRECTV and on channel 393 (HUNT) on Dish Network. Pursuit Channel’s digital signal is unencrypted and free to cable operators across the United States. If your cable operator does not carry the Pursuit Channel, contact them and request that they add it. Have them contact Pursuit Channel by phone at 334-335-6926 and they’ll provide the settings needed to acquire the signal. Born and raised in Arkansas, Rossi attended the University of Arkansas, where started as a wide receiver for the Razorbacks. He grew up hunting and fishing and although he resides in Los Angeles, still goes back to Arkansas to hunt with his dad. “I love being be a part of American Airgunner. I get to host a show about something I enjoy and grew up doing—shooting. And its the only place I get to blow some stuff up!” said Morreale. Rossi’s contagious energy and ability to capture audiences throughout different platforms has lead him to Host many different shows and be voted one of People Magazine’s Sexiest Men Alive. www.PyramydAir.com/blog – Read the blog written by the “Godfather” of airguns. Jim Chapman has hunted big game with firearms throughout the Western US most of his life. After college he moved to Europe, where he was introduced to high quality adult Airguns and the active airgun hunting culture in Britain. Returning to California ten years later, he started using these guns to hunt small game more seriously. In subsequent moves to Japan, Australia, and South Africa, he continued shooting Airguns along with firearms, hunting where and when the opportunity presented. In the early 2000’s, Jim was introduced to precharged pneumatic guns, and started traveling extensively to hunt with them, working his way across the country. A couple years later he was introduced to the first of the modern big bore airguns, and this is where big game airgun hunting kicked in! Jim has taken big game in every State where Airguns are legal and conducted the first sanctioned big game airgun hunts in South Africa, returning for six safaris since. Jim lives with his family in Minnesota and travels throughout the US and abroad to hunt with Airguns. Besides his hunting, review, and round table segments for American Airgunner, Jim is the airgun columnist for Predator Xtreme and authors regular feature articles for the magazine. He also writes a monthly series for the UK based publication Airgunner. And his byline appears in Outdoor Life, Fur-Fish-Game, Game&Fish, and several other outdoor publications. Jim has appeared in several hunting DVD productions, and has been a guest on several nationally broadcasted radio programs. Glenn Elliott has hunted turkey exclusively with pellet guns since 2010. He began airgun hunting at an early age with his father. He grew up in Chattanooga, Tennessee, where his dad gave him his first airgun at the age of four, a Daisy Red Ryder BB. At age eight, Glenn’s dad gave him a Crosman 760 Pumpmaster. After his father’s death Glenn spent many hours in the woods with his airgun as a way to connect with his Dad. Glenn later bought a Sheridan Silver Streak .20 pellet gun and the local golf course squirrel population was never the same. Airgun hunting took a back seat to college, but afterward Glenn took a job in Grand Rapids Michigan where he fell in love with bowhunting whitetail and eventually turkey. Glenn took all of his bowhunting whitetail knowledge with him in a move to California and applied that to bowhunting turkey. After many years of bowhunting turkey Glenn determined there must be a better way, but shotgun hunting just didn’t seem like a challenge after going after them for so long with a bow. After setting aside his skepticism, Glenn decided to give pellet guns a try since they were legal in California for turkey. After taking his first gobbler in 2010 with a gas piston air rifle and dropping it in its tracks, he was hooked and knew immediately he had found the holy grail of turkey hunting. After several years of air rifle turkey hunting, Glenn says that hunting turkey with an airgun is not only the most challenging form of turkey hunting, but also the most deadly. He often explains how airguns offer less chance of wounding a turkey when compared to both bow and shotgun hunting when done properly by taking only headshots within range. Waiting for a good close headshot makes air guns the most exciting form of turkey hunting and results in a clean miss or clean kill and less chance of wounding the bird. Glenn’s hunts can be seen on YouTube under “Pellet Gun Turkey Hunting Television”. His long term goal is to host his own TV show focused exclusively on hunting with air guns for different species all over North America. Rick Ward grew up on a small ranch in Texas where working horses and cattle were a way of life. Rick’s love for hunting started at an early age. After reading an article in a magazine on the challenges of calling coyotes, Rick’s interest focused on calling coyotes and less on trapping. Rick was given an old wooden hand call by a neighbor and he has never looked back. Rick is a national award winning Professional Rodeo Announcer and Voice talent. You may have even heard him on some of your favorite outdoor shows. Rick’s journey on the rodeo trail has allowed him to hunt coyotes all across the U.S. Rick currently resides in Georgia with his wife of 25 years and has three children. He says coyote hunting in the South East is a real challenge due to the abundant food sources and thick cover. Rick has guided hunts for several predator hunting videos. He is one of the founders of the Georgia Predator Hunting Association where he is the director of marketing. He and his team have worked with state officials and law enforcement agencies to get the laws updated to further support predator hunting and get suppressor hunting laws passed in Georgia. It was not until Rick relocated to a more populated area that he primarily started using PCP (Pre Charged Pneumatic) rifles and became known as The Urban Airgunner. Of course, he had experiences with BB guns and multi-pump air rifles; however, in order to take predators humanely he transitioned to the more powerful PCP rifle. In addition to hunting, air guns allow Rick and his family to hone their marksmanship skills and enjoy hours of shooting entertainment whether it may be a PCP rifle, a multi-pump or CO2 powered gun. Or even one of the favorite childhood BB guns when a friend’s child comes over for an adventure. Tyler Patner has been an airgunner since 2009, when he picked up his first airgun as a way to shoot quietly in his suburban backyard. From the first shot he was hooked, and has owned over 100 airguns since then. After graduating college in 2013, Tyler found a place in the airgun industry at Pyramyd Air, starting off as a customer service rep and moving up to his current position of Product Specialist. 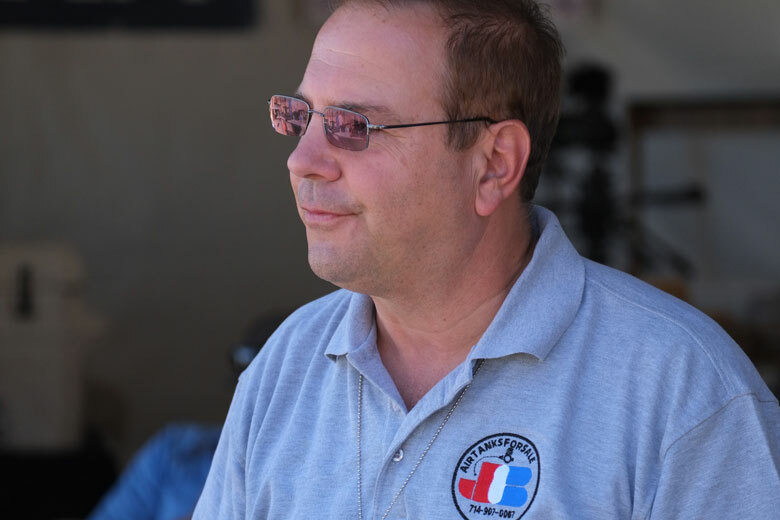 He is the host of the Pyramyd Insyder, Pyramyd Air’s product review video series, and serves as the match director of the Pyramyd Air Cup, a premier East Coast field target and airgun competition, held in New Philadelphia, Ohio. Tyler competes at an International Level in the sport of Field Target and has been a member of the US Field Target Team for two years. Since he started with the sport in 2012, he has won various regional titles (in multiple classes) and won his first national championship in the Open Pistol division in 2015. In 2016, he was elected to the AAFTA Board of Governors (the governing body of US Field Target) where he became the youngest governor to serve on the board. Tyler is also a founding member of the Ohio Airgun & Field Target Shooters Association. Steve Criner is one of the most head strong outdoor personalities in the outdoor television industry today. That’s exactly why he hunts Extreme Predators! With over 20 years of hunting experience, Steve developed an addiction to calling wildlife in close at a young age. This addiction sparked his interest in predator hunting. Steve’s involvement in extreme sports like bull riding, bull fighting, motorcycle racing, and rodeo solidified the fact that he craves excitement and hunting predators was a perfect fit! In 2013, American Airgunner asked Steve to join us in the pursuit of airgun hunting. From a mean wild boar to troublesome birds, Criner will show us the challenges of hunting with both PCP and springer air rifles. Whether Steve is hunting gators in Florida, rattle snakes in Texas, shooting coyotes and bobcats in the red dirt of Oklahoma, or noodling catfish in Arkansas, Steve feeds off the fact he is taking you along with him through his TV productions. Plain and simple, if it’s exciting you’re going to know it and feel like you’re right there with him. Eydin Hansen Outdoor enthusiast and brand exploration. Cast member on American Airgunner and professional staff for multiple companies. Joe Brancato "the Airgun Scientist"
In a world full of GMO’s and artificial everything, hunting is a way to guarantee the purest form of organic protein. Chef Bri has dedicated herself to hunting for the food she eats and is passionate about showcasing the beauty of wild game meat. She creates recipes that are simple yet elegant and proves that there is more to wild game than just grilling the back strap!